India’s Polar Satellite Launch Vehicle has successfully deployed the French SPOT-7 imaging satellite on Monday. Liftoff from the Satish Dhawan Space Centre was on schedule at 09:52 local time (04:22 UTC). The satellite – along with some smaller companions – was delivered to a sun-synchronous orbit around 655 kilometres (407 miles, 355 nautical miles) in altitude at an inclination of 98.23 degrees. The SPOT-7 satellite is identical to SPOT-6, which was deployed by another PSLV launch in September 2012. 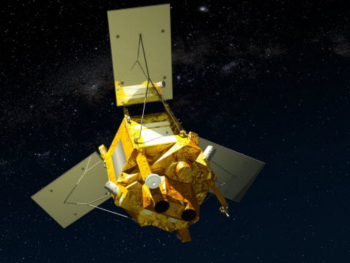 Both satellites are designed for ten years’ service, and were constructed by Airbus Defence and Space (formerly EADS Astrium), around the AstroSat-500 Mk.II bus. SPOT-7 has a mass of 714 kilograms (1,574 lb) and is powered by twin solar arrays which generate 1,450 watts of power. Two imaging systems aboard the spacecraft, the New AstroSat Optical Modular Instruments (NAOMI), are capable of producing panchromatic images at a resolution of 1.5 to 2.2 metres (4.9-7.2 feet), and multispectral images at a resolution of 6.0 to 8.8 metres (19-29 feet). These instruments can cover a swath of 60 kilometres (37 miles). SPOT-7 is the seventh spacecraft in France’s SPOT, or Satellite Pour l’Observation de la Terre, programme. The first satellite in the series, SPOT-1, was placed into orbit by an Ariane 1 rocket in February 1986 and operated for four years before it was replaced by SPOT-2. Identical to its predecessor, SPOT-2 was launched by an Ariane 4 in January 1990. A third satellite was also orbited by an Ariane 4, in 1993. In 1998 a larger satellite – SPOT-4 – was launched. This mission added a new infrared imager to the optical imaging payload carried by its predecessors. SPOT-5, which was orbited in May 2002, featured further modifications which enabled it to return higher-resolution images and produce stereoscopic images for three-dimensional mapping. The SPOT satellites are operated by a commercial contractor, Spot Image, on behalf of the French Centre National d’Etudes Spatiales, or CNES. Operated in the same orbit as France’s high-resolution Pleiades satellites, SPOT offers a lower-resolution, wider-angle view of the Earth’s surface to compliment the images which Pleiades returns. Five small satellites joined SPOT-7 for its journey into orbit; Canada’s CanX-4 and CanX-5, Germany’s AISSat-1, and Singapore’s two-satellite experiment VELOX-1. The two CanX satellites form part of the University of Toronto’s Canadian Advanced Nanospace Experiment programme. Identical in design, the two spacecraft are based on Canada’s Generic Nanosatellite Bus, which was first demonstrated by the CanX-6 satellite which launched in 2008. Cubic in shape, each spacecraft has a mass of around seven kilograms (15 lb) and sides measuring 20 centimetres (8 inches). Solar panels affixed to the body of the spacecraft will be used to generate power for its instruments, with a rechargeable lithium ion battery being used to store up to 5.3 amp-hours of current for use when the panels are not exposed to sunlight. The primary objective of the two CanX satellites is technology demonstration. The satellites are both equipped with the Canadian Nanosatellite Advanced Propulsion System (CNAPS), a cold-gas three-axis stabilisation system which will enable manoeuvring and formation-flying in orbit. The satellites will test the Formation-Flying Onboard Nanosatellite Algorithm (FIONA), a piece of software which engineers hope will allow the satellites to maintain formation once deployed. The satellites also carry GPS receivers which will be used for calculating their positions and velocities. AISat-1 is a 14-kilogram (31 lb) satellite to be operated by the German Aerospace Centre, the DLR. Equipped with a four-metre-long (13 foot) helix antenna the satellite will be used to pick up identification and search-and-rescue signals from ships at sea and relay them to its ground stations. The mission will also provide on-orbit testing for the Clavis satellite bus developed by the DLR, and fulfil other technology development objectives for Germany. Singapore’s VELOX-1 consists of two satellites which will be deployed together. The smaller of the two satellites, PSAT, will be deployed from the larger, NSAT, which is a three-unit CubeSat. Destined for a two-year mission, NSAT is a 4.25 kilogram (9.37 lb) satellite. Its primary instrument is a small camera which will be used for Earth observation. The PSAT spacecraft, which has a mass of 250 grams (8.82 ounces), will be deployed from NSAT during its mission in order to test intersatellite communications. The smaller satellite has dimensions of 3 by 6 by 7 centimetres (1.2 by 2.4 by 2.8 inches) and a life expectancy of one year. 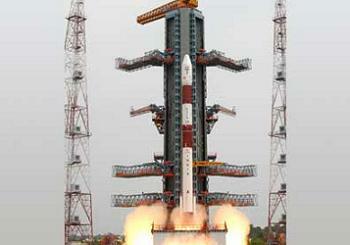 Monday’s launch marked the twenty-seventh flight of India’s Polar Satellite Launch Vehicle. The workhorse of India’s space programme, the PSLV made its maiden flight in September 1994 with a failed attempt to orbit the IRS-1E remote sensing satellite. 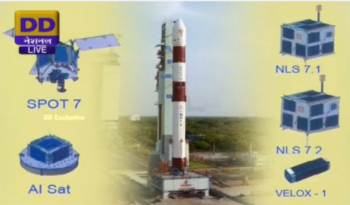 For the SPOT-7 mission, flight C23, the PSLV will fly in the Core Alone (PSLV-CA) configuration. The Core Alone variant of the PSLV first flew in April 2007, with Monday’s launch marking its tenth flight. The rocket consists of the same four stages as the standard PSLV, but without the six PS0M boosters which the standard configuration attaches to the first stage. The flight of PSLV C23 began with the ignition of the first stage’s solid-fuelled S-138 motor at the T-0 point in the countdown, propelling the rocket into the sky above Sriharikota. The powered phase of first stage flight lasted around 102 seconds, with separation occurring at 110.6 seconds after liftoff. The second stage ignited two tenths of a second after staging, at the start of a burn which lasted around 150 seconds. Separation of the payload fairing occurred at the 176.7-second mark, with the PSLV at an altitude of 131.5 kilometres (81.7 statute miles or 71.0 nautical miles) – taking it clear of the Earth’s atmosphere. The second stage, which is liquid-fuelled and powered by an L-40 Vikas engine burning unsymmetrical dimethylhydrazine and dinitrogen tetroxide, separated 262.2 seconds into flight, making way for the solid-fuelled third stage to fire 1.2 seconds later. The motor used on the third stage, an S-7, utilized a burn time of 110 seconds. Ignition of the fourth stage occurred eight minutes, 51.2 seconds after liftoff, ten seconds after the rocket jettisoned its spent third stage. The PSLV’s fourth stage was powered by a pair of L-2-5 engines, fuelled by monomethylhydrazine and mixed nitrogen oxides. Its single burn lasted eight minutes and 25.5 seconds, placing the satellites into their planned orbit at 655.1 by 657.7 kilometres (407.0 by 408.7 miles, 353.7 by 355.1 nautical miles), with inclination of 98.23 degrees. SPOT-7 was the first of the payloads to separate, thirty seven seconds after the end of powered flight. Forty seconds later AISat-1 was released, with CanX-4 and 5 being deployed thirty and sixty seconds after that. The final separation event was for VELOX-1-NSAT, twenty five seconds after CanX-5. The PSAT spacecraft was deployed from NSAT at a later date. 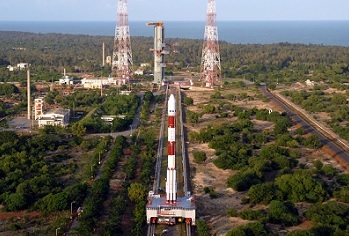 The venue for the launch of PSLV C23 was the First Launch Pad of the Satish Dhawan Space Centre on Sriharikota Island. India’s only orbital launch site, the Satish Dhawan Space Centre is named after a former chairman of the Indian Space Research Organisation who died in 2002. The facility was previously known as the Sriharikota High Altitude Range, or SHAR. Despite its name, the First Launch Pad is not the oldest complex at the centre; abandoned complexes to the south were used by the Satellite Launch Vehicle and Augmented Satellite Launch Vehicle, while the site also includes sounding rocket facilities which predate the current orbital pads. Two orbital launch complexes are currently used at the Satish Dhawan Space Centre. The First Launch Pad is primarily used for PSLV launches, while the newer Second Launch Pad serves a mixture of PSLV and GSLV missions. The second pad is currently being prepared for a suborbital launch which will mark the maiden flight of India’s newest rocket, the Geosynchronous Satellite Launch Vehicle Mk.III. That mission is currently scheduled for late July or early August. India’s next orbital launch will be made at an unspecified date later this year, with a PSLV carrying the third satellite in India’s IRNSS navigation system. Another such launch is also believed to be scheduled for the end of the year. Overall, the PSLV launch was the thirty-fifth orbital mission of the year. Of the preceding thirty-four launches, all but one have been conducted successfully – the failure being May’s attempt by a Russian Proton-M to deploy the Ekspress-AM4R satellite. (Images via ISRO and associated payload websites).